Do you think the Twitter client part of Tweetminer is useful? a) Do you think Tweetminer should ONLY be about the RSS screen & scheduling, and do you think I should spend my time & effort enhancing it along with other back-end features such as auto friend discovery, adding, etc. b) Do you think I should keep enhancing the Twitter client with groups, search, etc. I’m finding TweetMiner great for spreading the news! I find I use the RSS part of TweetMiner more or less exclusively. I have TweetDeck for real time tweets when I'm a comp & Twidroid for my phone so I don't tend to use the Tweeting part. So I would say I would like to see more in the RSS part of TweetMiner. I agree with DevJonny; The RSS side of things is quite outstanding and I could find it only once somewhere else, in a different format though (TwitRobot.com - I think it does it the other way around though, not sure, just discovered it 5 min ago, haven't analyzed yet). I’m happy with the way it is now already! It certainly should not be "only" about the RSS and scheduling... As it is NOW, it is quite useful to be able to flip back and forth between more than one Twitter ID and be fully operational under that ID. TweetDesk is too confusing with all the various columns (I can't never remember under which Twitter ID I am). 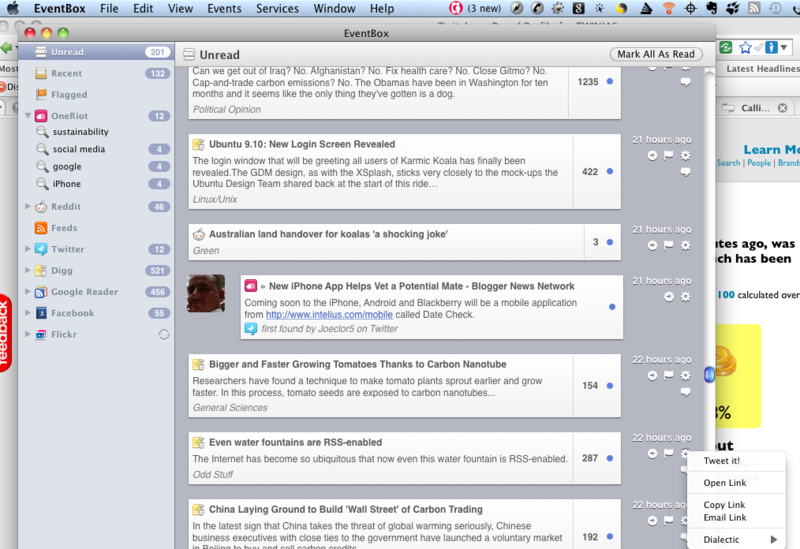 I love Tweetminer (after discovering it 5 minutes ago from Stephan Becker) and I am not even using the RSS feeds (yet). It certainly should not be "only" about the RSS and scheduling... As it is NOW, it is quite useful to be able to flip back and forth between more than one Twitter ID and be fully operational under that ID. TweetDesk is too confusing with all the various columns (I can't never remember under which Twitter ID I am). I love Tweetminer (after discovering it 5 minutes ago from Stephan Becker) and I am not even using the RSS feeds (yet). Ok, I will focus on the overall app as peoples needs float to the top. Some of the time it might be RSS some of the time it might be Twitter client. I’m happy you are asking for pre-beta input. Justin- overall we love the app - thanks for porting it to Adobe Air; albeit, there are some new bugs as a result. Your schedule feature is one of the best I've used. You may want to consider adding other services to Tweetminer; I've attached a screenshot from EventBox - whichh interesting hooks up to (Google Reader, Digg, Facebook, Flickr, Reddit, OneRiot, Identi.ca). Though I do not find Identi.ca or OneRiot very useful. Another cool feature EventBox has is the ability to show all the unread items in a single stream - useful for those of use with multiple accounts and also monitoring Digg, Google Reader, Reddit. Seesmic is also an Adobe Air app; so you might get some UI ideas for the Tweetminer desktop air from Seesmic. Two other things I like about Seesmic: (1) links open to my default browser vs. internal app browser (Firefox in my case) and (2) the Shrink text / Add Image options are cool. I was using an app the other day that automatically shortened the links to bit.ly after pasting long link into the tweet cell; but can't remember which app that was ... hmm brain is fuzzy after last night. One of the first things might be checking the sending of the signup confirmation emails. I tried registering with two different email addresses but both rejected the message as spam. Mail server logs about technicalities available if needed. Cheers! One of the first things might be checking the sending of the signup confirmation emails. I tried registering with two different email addresses but both rejected the message as spam. Mail server logs about technicalities available if needed. Cheers! I would love to be able to chose sending messages through more than one Twitter profiles. The ability to configure to roll to the top of timeline or to keep the position of the last read/seen tweets position. Or maybe I just missed how I can do this? It feels pretty basic thing to me. I would love to be able to click on the source tweet and be reminded of the tweet they responded to. ie To be able to view the conversation thread? Yes, exactly. Sometimes I'll get one word responses to my tweet and it's not evident what they responded to. Being able to see the thread would be great. I just set up my first rolling tweet! It would be nice if I could set them up to roll until a certain time or date, so I don't have to think about turning them off, they'd simply expire. Loving what you've done here. This is the BEST twitter client YET!!! Have you seen the time window stuff? I've got another one for you. When I click to tweet or reply or reply all, etc. the cursor comes up BEFORE the @names. It'd be much preferable if you could have it default to AFTER the names automatically, then I could simply begin typing without having to reset the cursor. It doesn't do that in the desktop version. I assume that is a possible fix, though. When I mouseover an avatar, I'd like to be able to have Follow and Block as options. In the desktop version... When I mouseover an avatar, I'd like to be able to have Follow and Block as options. I’m FRUSTRATED. I'm getting to responses to any posts. I'd like to be able to schedult multiple tweets. Tweet #1 goes out every Monday at 9am. Tweet #2 goes out twice a week (on Mondays and Thursdays). Continually, not once and then I have to schedule it again.